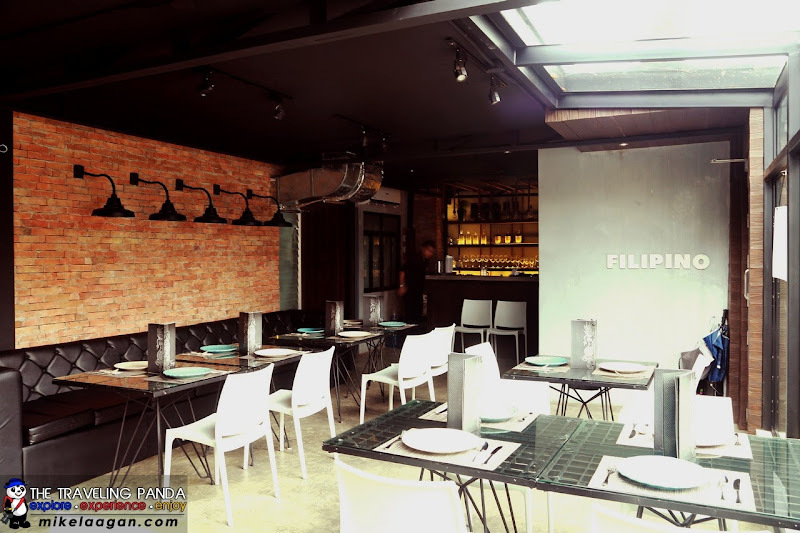 I was browsing through some pages when I chanced upon this new restaurant in Tomas Morato - Tiago. 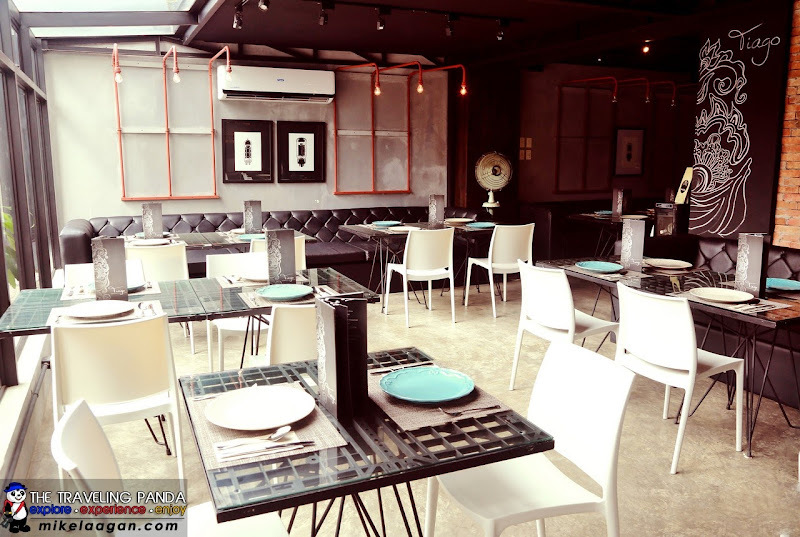 The restaurant had their soft opening last September 8, 2013 and barely two months, they are already getting praises for their sumptuous dishes. 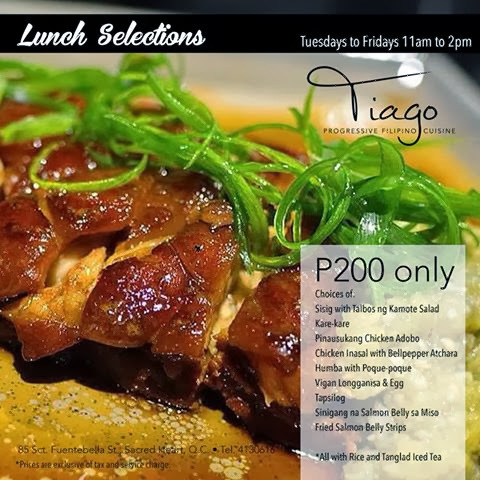 Tiago offers Progressive Filipino Cuisine as the owners John Buendia, his wife Sigrid Aragona-Buendia and multi-awarded chef, Kenneth Villaluz call their dishes. Tiago was also named after the Buendia's firstborn son, Santiago. 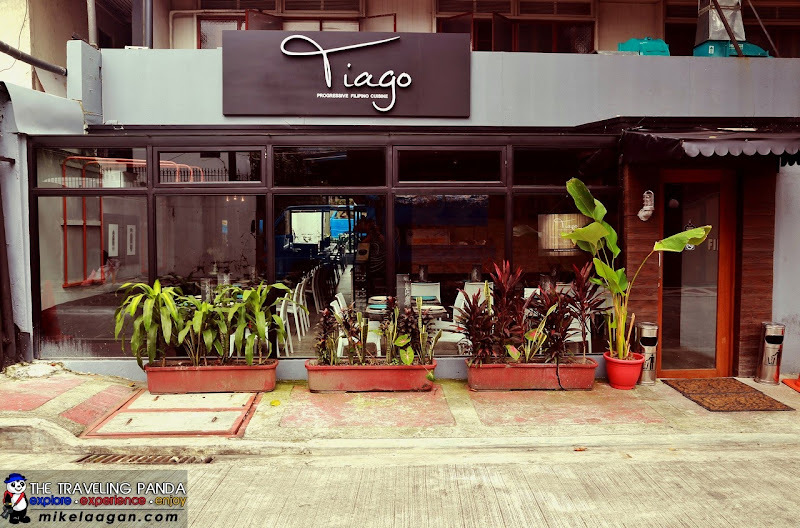 My friends and I agreed to visit Tiago for lunch and try out their food. 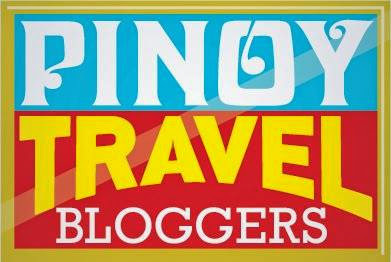 One of the owners, Sigrid Aragona-Buendia was there to welcome us and she said, "Our dishes and recipe constantly evolve, that's progressive cuisine!" Unlike most restaurants that have signature dishes, Tiago strives on dishes that evolve and can change regularly. 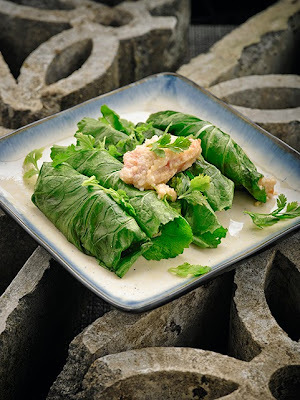 They add an ingredient or two to a favorite Filipino dish to further enhance the taste. 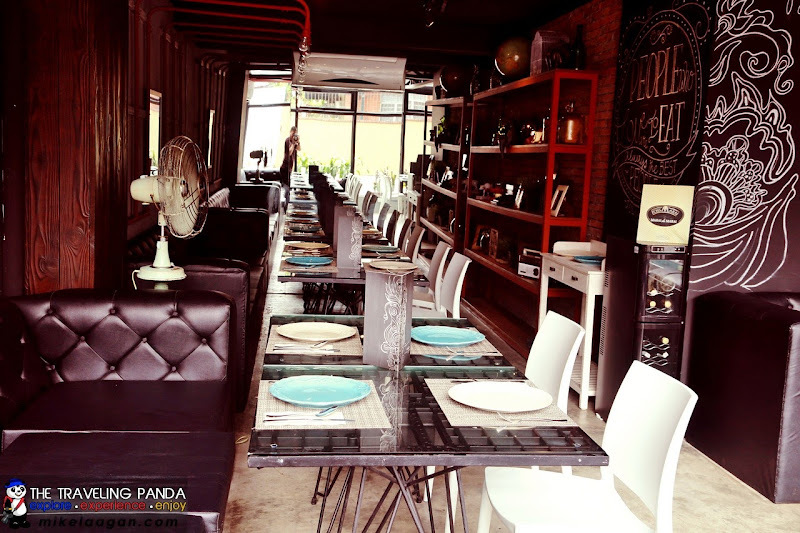 This is the trend nowadays where diners want to go away with the traditional dishes. Tiago can seat around 30 people and have huge glass walls extending to the ceiling. This give the restaurant ambient natural light during the day and view of sky during nighttime. The brick walls on the opposite side give that feeling as if you're in the old Spanish era. They ran out of the Ube Shake I ordered so I had to try the Sweet Corn Shake. 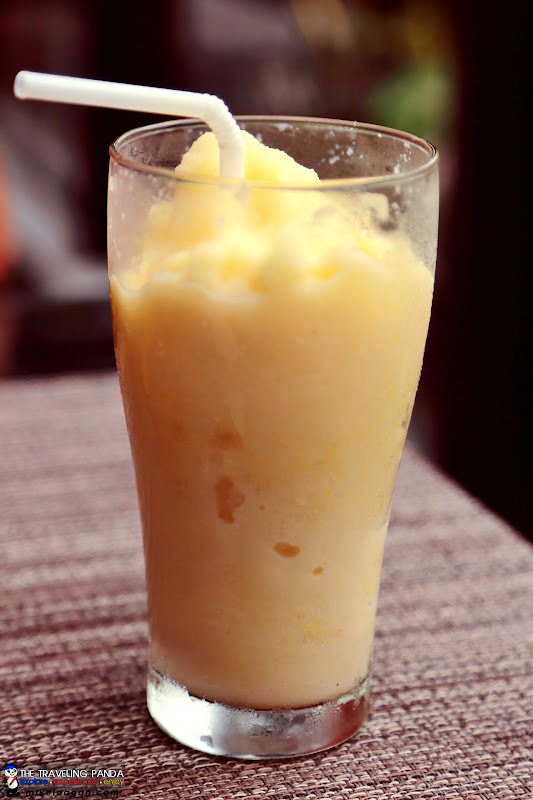 I am not a big fan of sweet corn, but I was really amazed on how my shake turned out. For starters we had Chopsuey Salad, an offshoot from the usual Chopsuey using the same vegetables but adding shrimp, squid rings and calamansi vinaigrette for dressing. 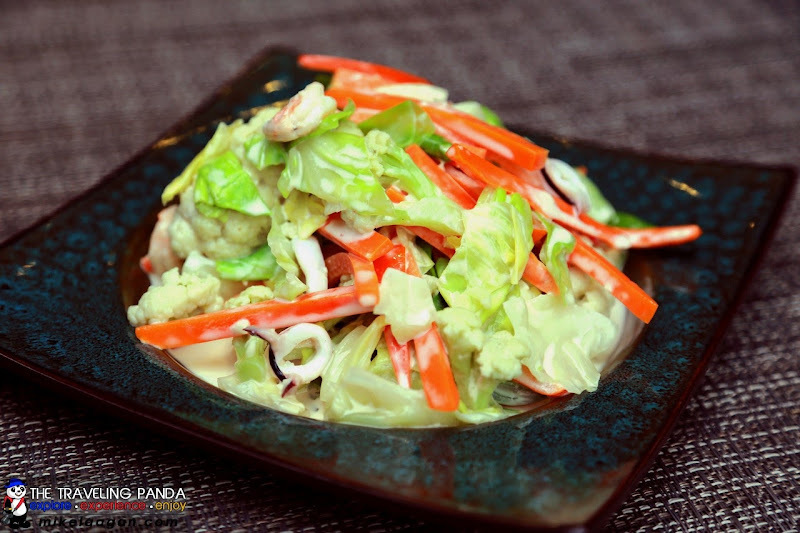 The dressing adds creaminess to the fresh and crispy vegetables. The Inihaw na Tilapia Roll came in next. Burong Hipon was added as dip or "sawsawan" to this dish. 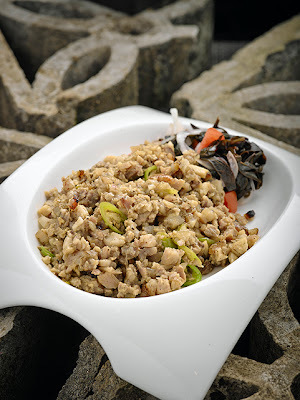 For those who do not know, "Buro" or Balao-balao originated from Pampanga and is fermented rice with mixed fish, mainly a condiment for steamed / boiled vegetables. 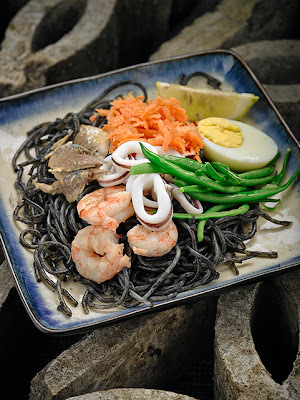 The buro can be prepared plain or mixed with either fish or shrimp. My parents usually mix it with their food as appetizers. This is something different from the traditional way of eating this dish. The sliced fish meat is usually mixed with the buro and wrapped together. What Chef Kenneth did was he grilled the Tilapia, chopped it into smaller pieces and wrapped it in Mustasa leaves. Then the Burong Hipon was added on the side so diners have the choice on how much buro will be mixed with the Tilapia roll. I am not a big fan of buro and I have never tried it even if we always have it in our house. There's no harm in trying it for the first time on this dish, and so I did. The verdict: it's good with the buro. 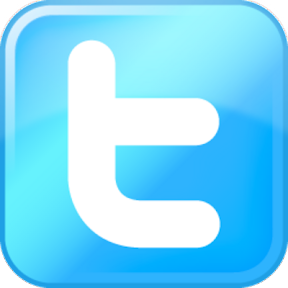 You may request the staff to serve the buro on the side. The main dishes came in next. The Pinausukang Chicken and Pork really looked tempting, I wanted to get a bite already before taking pictures. According to Sigrid, this dish need three to four hours of continuous smoking. Reminds mo so much of Gaucho where the meat is roasted for at least six hours. The chicken and pork are smoked at the restaurant so diners are guaranteed that they are fresh and not reheated. The slow cooking process makes the chicken and pork trotters (pig feet) tender and while aborbing all the flavors. 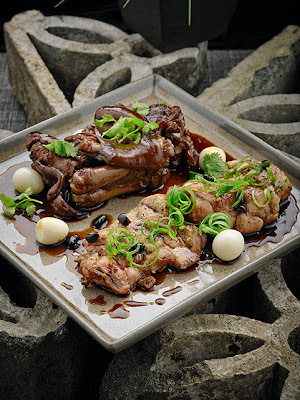 Mindanao Adobo sauce is added as base flavor to the meat. 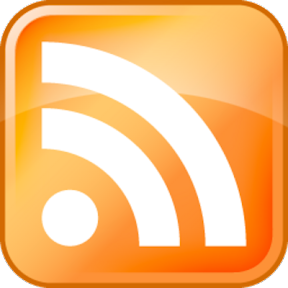 This adds sweetness to the dish. . 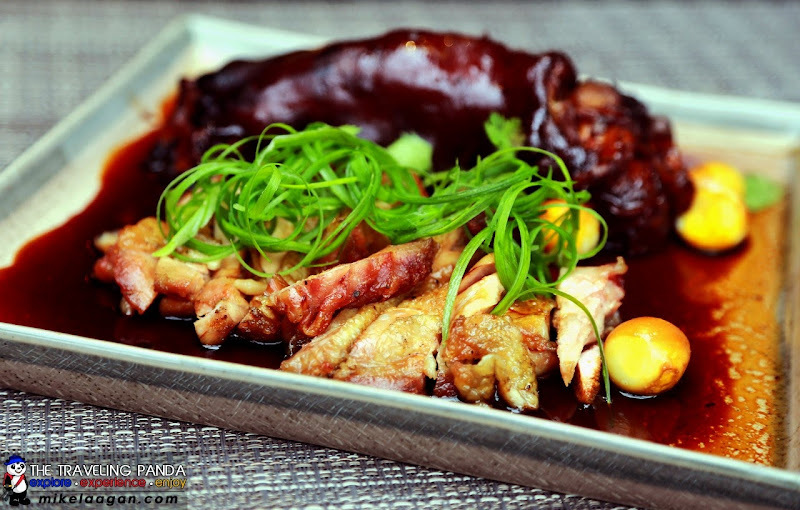 The chicken and pork trotters is a good combination and similar to the Chicken and Pork Abodo, the difference is the method of preparing the dish. 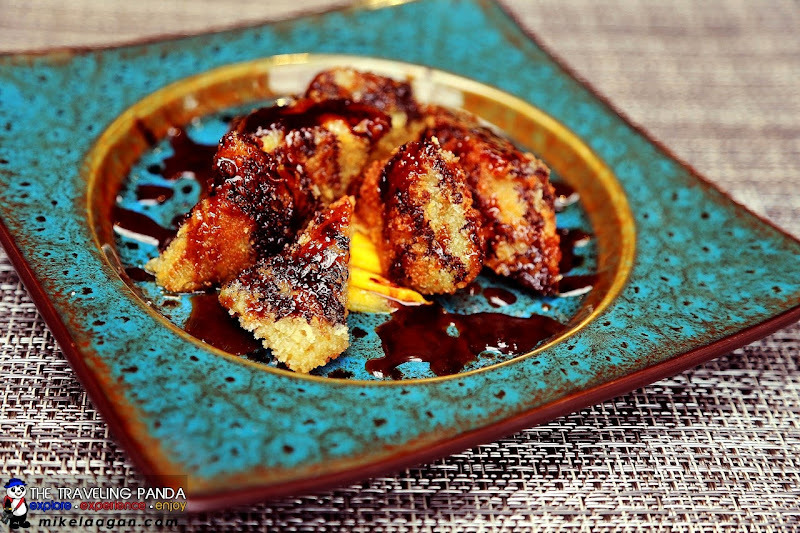 Diners should really try this dish, which is among the best-sellers of Tiago. It is best eaten with plain rice. The last dish was Pork Sisig. At first, I thought it was "Dinakdakan" and I was not even sure it was sisig since it was served in a very clean white plate, very much different from the greasy sizzling plate. The pork cheeks and nape cooked with onions and chili was served with the usual calamansi and for a change, kamote tops was added. 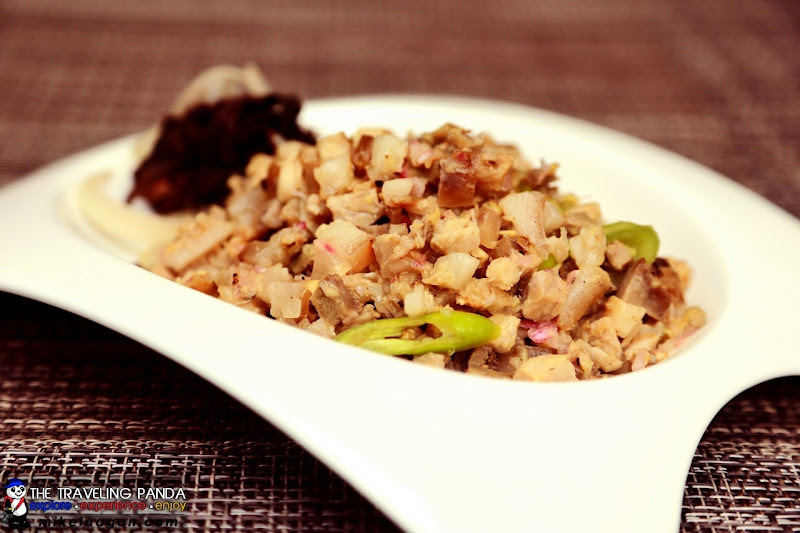 The kamote top and calamansi accentuated the taste of the pork sisig. Best pork sisig I've had for a long time. 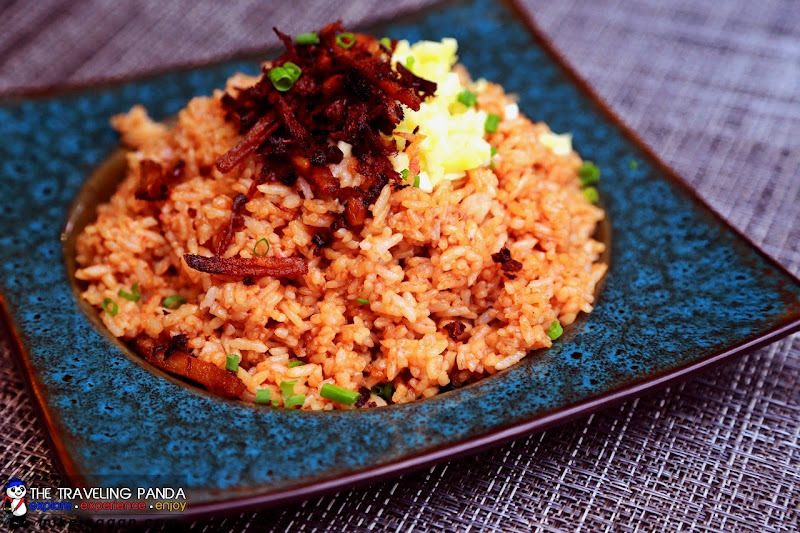 We were able to try two variations of fried rice from Tiago - the Adobo Rice and Tinapa Rice. 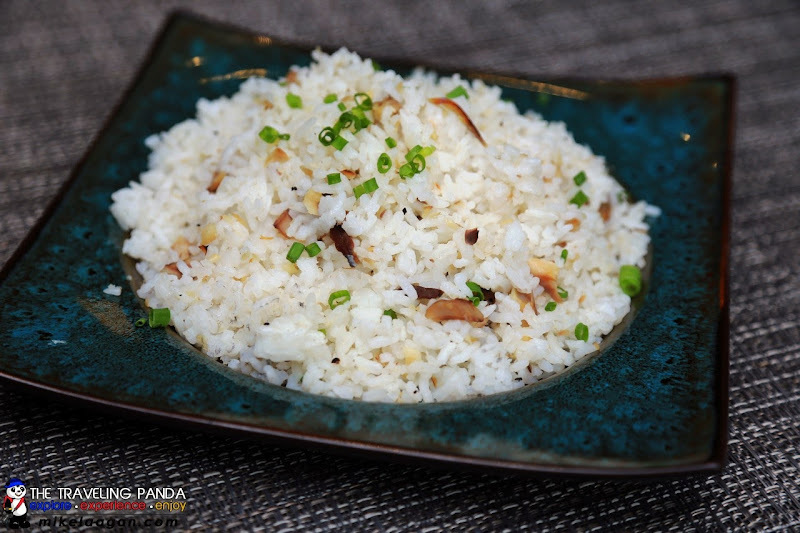 The Adobo Rice is prepared with tidbits of green mango, sliced onion leaves and Adobo flakes. The Tinapa Rice's smell was soothing in my nose as I was taking pictures. There's really nothing different about it but the smell and taste of the Tinapa (smoked fish) mixed with sauteed garlic really made the fried rice really delicious. I paired this rice with the Pork Sisig. For dessert, we had a different version of Leche Flan. 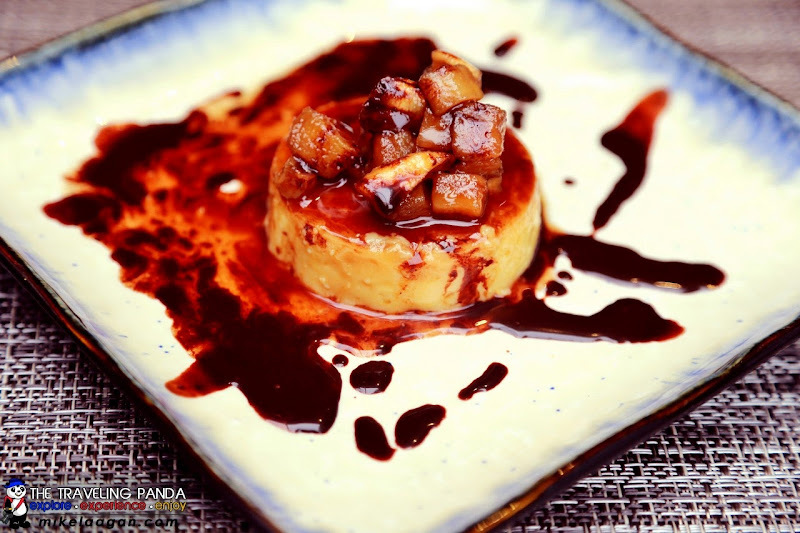 Instead of using milk, Chef Kenneth used coconut cream to prepare the flan and topped it with sweetened sago and saba. The taste is really heavenly. I would like to commend Tiago for this dessert. Our second dessert was Suman. I usually eat suman by dipping it in sugar but the suman served to us was breaded and served with Chocolate Tablea sauce. The breaded suman was also topped with ice cream while latik and mango slices were added in the mix. 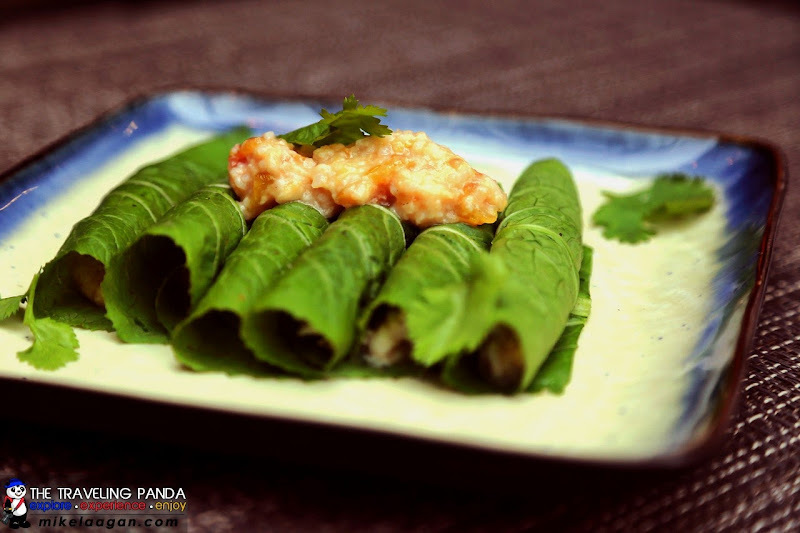 I never thought suman can be eaten differently. I took a picture of our lunch before we started to devour on our sumptuous meal. I also requested from the staff to put our desserts in the freezer and have it served when we finish eating. 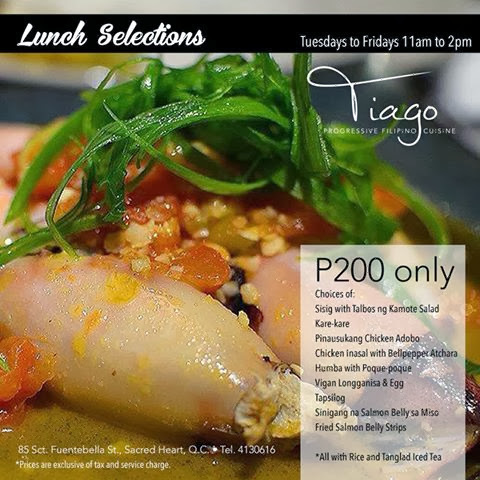 I seldom meet with friends for lunch but I was really glad we decided to have lunch at Tiago. Food was really delectable and value for money is really good. 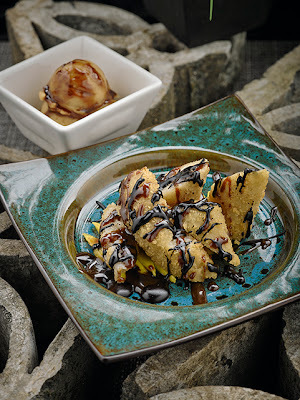 I can't wait to come back here and taste the other dishes including the interesting Fita Ice Cream Sandwich. The dishes in Tiago are for sharing and it is always more enjoyable to eat with good company. 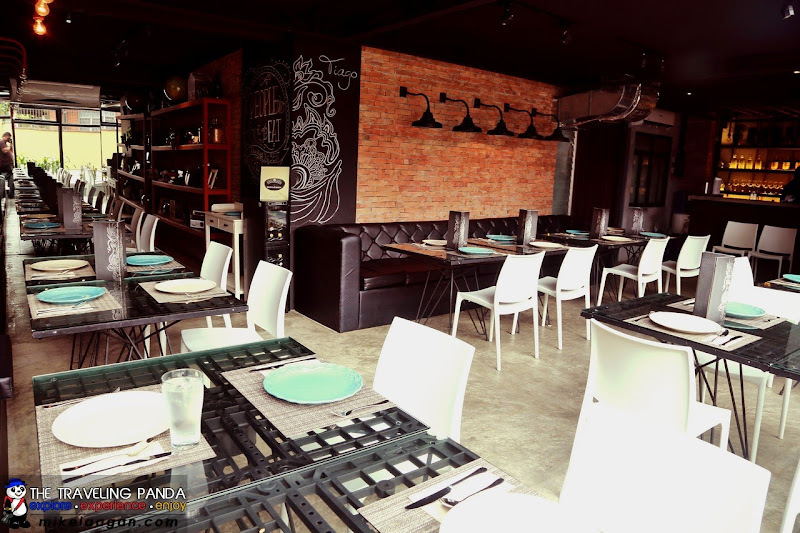 So bring your family or friends when you plan to eat at Tiago and experience what progressive filipino cuisine is. If you are eating solo, there are also options with Tiago's Lunch Selections. 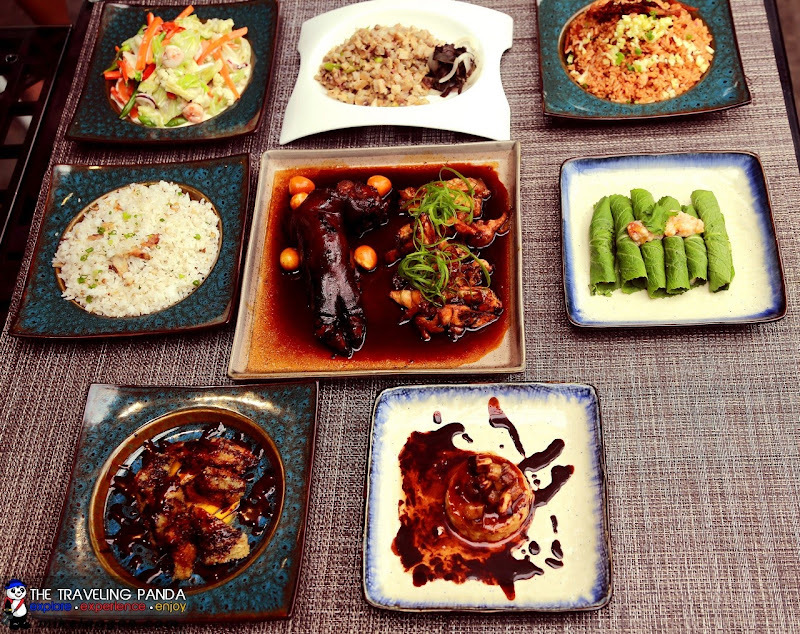 For Php 200.00, one can choose from nine (9) dishes all served with rice and Tanglad iced tea. 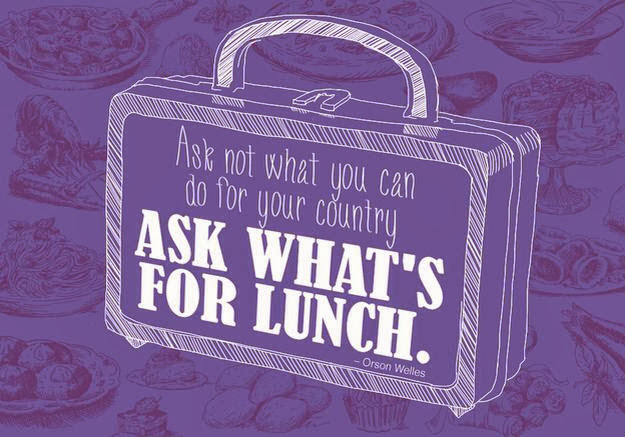 Lunch Selection is available Tuesdays to Fridays from 11:00AM to 2:00PM only. the leche flan looks tempting :) walang dinner selections? Food is different but good. 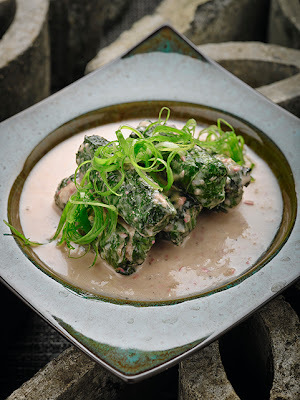 The chef adds twist to classic Filipino dishes. I hope to come back here to try the other dishes. I wanna come back here and try the other dishes and if may new. soft opening pa sila nung napadpad kami dito. sama ka?